Many of you know Harry's room used to be my craft room. Last summer I sold a bunch of my crafty stuff at my dad's garage sale to make room for le bebe. I got rid of a lot but couldn't part with everything, so Harry has to share his room with my stuff. To compensate I did redecorate the room with a more boyish theme; it had a very Parisian/shabby chic look before. I know it's kind of crowded, but I think we made it work as best we could. You can see my craft table in the corner with my Cricut machine (I found the black one on clearance at Walmart after my Expression died on me in September) and other scrapbooking supplies. All my Cricut cartridges are on the shelves along with embossing tools and Harry's stuffed animals. The circles on the wall are embroidery hoops with fabrics in them. The project was really simple to make and cost less than $30 to cover the whole wall! Here's our changing station. Every morning I open the blinds and Harry always smiles and coos as he looks outside while I change him. One thing I wasn't sure how much we'd actually use was the diaper stacker. But holy cow, I love that thing! It makes grabbing a diaper really easy and can hold over 100 diapers at a time. I love how our crib can transform into a toddler bed and eventually be used as the headboard and footboard of a full sized bed. I had initially planned on using the bumpers that came with our crib set (the Mosaic Transport set from Kidsline), but we decided not to after they were banned in Chicago because they can increase the risk of SIDS. However, I plan on using them to cover up the top of the crib if Harry starts chewing on it (kind of like this). We bought our nursery furniture online and I was really surprised at the size of the dresser. I had expected it to be a lot larger, but it works for now. The little table came with our glider and is meant to hold bottles and other feeding supplies. But since our rocker is next to my craft table I put a picture frame and little teddy bear on it. Surprise, surprise, the closet used to be filled with craft stuff. Baby stuff has kind of taken over the space but I still keep a lot of my supplies in there as well. Right before I was hospitalized in August Ant and I talked about painting the room. We even got paint samples and were about to ask our landlord when my blood pressure skyrocketed so we never ended up doing it. Oh well. But there ya have it! 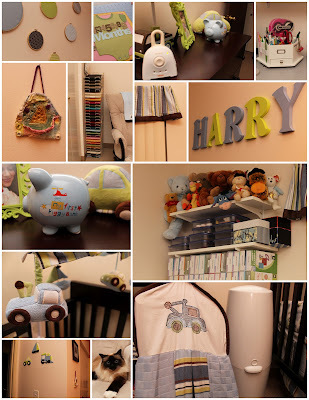 I'm pretty pleased with how the nursery turned out considering I couldn't spend a whole lot of money on it and had to keep all my craft stuff in the room.